Drive through almost any neighborhood or even commercial areas with recreation facilities, and you’ll notice a common item: basketball hoops. Many kids grow up casually shooting hoops in the driveway or playing a pickup game with friends. Even kids who don’t know the rules of the game have probably played a variation of Knock-Out or H-O-R-S-E during P.E. or day camps. Special needs kids may feel unwanted and inadequate during these games, whether friendly or competitive in nature. Special needs basketball is a great way to give these kids a chance to try something new in a safe environment as well as receive guidance and instruction, develop social interactions, and gain confidence in their own abilities. We’ve all been there: you’re out in public and someone calls your name: “Hey, Joe! Come over here and give this a whirl!” Whether it’s joining a game you’ve never played, tasting a new dish, or attempting a never-before-seen stunt on a bicycle, unfamiliar territory tends to make each of us uneasy. “What if we fail? What if we don’t like it? What if we break it? What if . . .?” So if trying something unfamiliar makes able-bodied adults and kids uncomfortable, how much more stressful is it for special needs kids? In a safe environment, basketball set-ups designed for special needs kids allow them to participate and have fun in a very common sport without the risk of public failure. A special needs program’s basketball court also provides a place for kids to realize that they are not alone. They will get to learn and develop these new skills together. 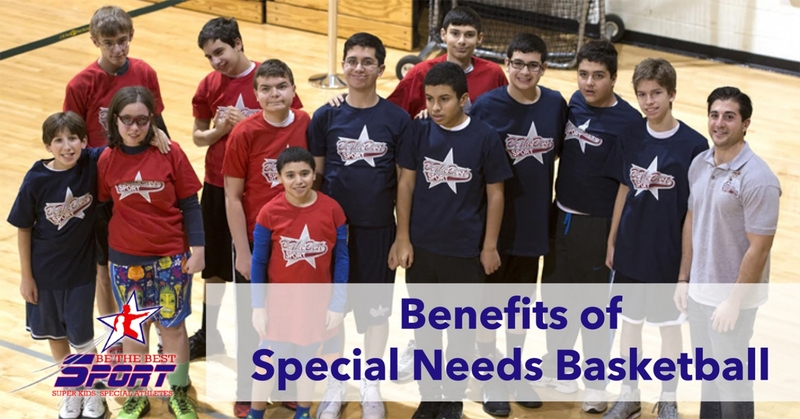 Special needs kids have a wide variety of developmental needs, and basketball programs for these kids are usually designed with certified teachers and coaches who can work closely with each child to teach him or her the fundamental skills of the game. From basics like dribbling to more advanced skills like blocking and free-throws, special needs kids will be met at their level and aided in progressing through skills on the court. In some cases, special needs kids are paired with a peer or staff mentor who can demonstrate by example and provide even more individualized support. Rules of play are modified to fit national guidelines, such as the National Wheelchair Basketball Association’s set of rules, which provides needed accommodations and enables fair play while still teaching the fundamentals of the sport. Many special needs children are unable to take part in most schools’ team sports. An environment where these kids can actually join a team and learn how to be a team player provides a positive setting for verbal interactions, friendly play, and general social development. Basketball in particular sets up a fantastic opportunity for verbal and physical teamwork as every member of the team learns together to navigate their way down the court. Players learn how and when to indicate that they are open, to receive the ball, and to communicate with verbal calls or nonverbal signs to whom they intend to pass the ball. Kids will also learn to work together when not on the court, especially in areas such as encouraging their teammates, good sportsmanship, and respect for others: their own teammates, coaches, referees, and other teams’ players. Learning social and teamwork skills will benefit kids in a multiplicity of settings. In any sport, a so-called “good player” will demonstrate knowledge of the game, coordination, depth perception, a sense of timing, and a sense of confidence in himself. That confidence actually results from having a grasp on these other “good player” abilities. Special needs individuals can greatly enhance self-esteem and confidence as they learn the rules of the sport and receive patient instruction that develops their coordination and senses. Basketball provides development in hand-eye coordination as well as both gross and fine motor skills. With basketball hoops so prevalent in our neighborhoods and recreation areas, an understanding of the basic rules of basketball paired with confidence in basketball skills can level the court and open the door for positive interactions with kids of all abilities. Be the Best Sport recognizes that fun, guided play and one-on-one instruction can give each person the chance to succeed at basketball! With a creatively designed program that includes both on-court practice through drills and games as well as carefully supervised real-game play, our certified coaches work closely with kids to develop basketball skills, physical health and athletic ability, positive social interactions, and a personal sense of accomplishment.